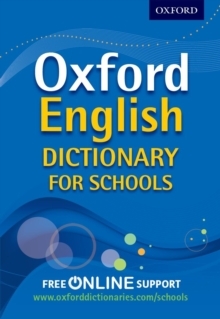 The Oxford English Dictionary for Schools is easy to use with its clear signposting, accessible design, and expertly levelled look and feel. It has extensive vocabulary including all cross-curriculum words, so it is ideal for preparing for Controlled Assessments. It is powered by the Oxford Children's Corpus, a unique electronic database of millions of words written for children. Added extras in thisdictionary are the language panels for project work, synonyms for overused words to develop wide-ranging language skills, and citations. Real example sentences from the best children's books and teenage fiction show students how to use language most effectively. There are inspiring examples from authors suchas David Almond, Philip Pullman, William Golding, Anthony Horowitz, Beverley Naidoo, and many more from the curriculum reading lists.